DENVER, CO--(Marketwired - March 19, 2016) - Shane Co., the "go-to" resource for couples planning to get engaged, is reminding everyone planning to pop the question that this Sunday, March 20, is the day to finally do it. This holiday coincides with the Spring Equinox and is an ideal way to commemorate the first day of a commitment to spending forever together. Propose at the Place Where You First Said, "I Love You." Emily was training for a mini marathon and was joined by boyfriend Eric and his brother on a cold winter morning in preparation for the big race. Halfway through the run Eric stopped at a bench for a drink of water, then turned to Emily and asked, "Isn't this where I told you I loved you for the first time?" Emily agreed, then was surprised when Eric grabbed her hand, walked her over to the pond, and proposed with a stunning split-shank halo engagement ring in 14k white gold. Without hesitation, she said "yes!" 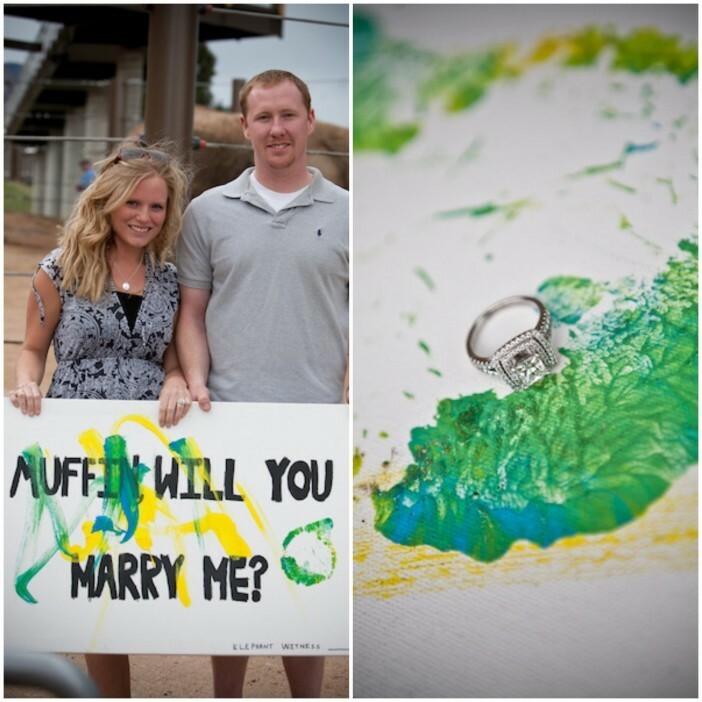 Get Artistic When You Pop the Question. This incredible proposal at the Cheyenne Mountain Zoo in Colorado Springs is one of our all-time favorites. John suggested to his girlfriend Caitlin that they stop at the zoo after a walk through Garden of the Gods Park and lunch. When they arrived at the zoo, John walked Caitlin over to the elephants who paint pictures, and together they watched the zookeeper bring out a canvas, paint and brushes for Lucky the elephant to use. When the zookeeper turned around to show the audience the painting, John was on bended knee as Caitlin saw "Muffin, Will You Marry Me?" with Lucky's artistic brush strokes. She said "yes" to one of the most unique marriage proposals of all time, and loved the gorgeous double-halo Shane Co. ring. Include Adorable Kids in the Marriage Proposal. Jonathan wanted to surprise Lauren, a reading specialist at an elementary school in the Kansas City metro area, with a proposal that included the principal, coworkers and her students. 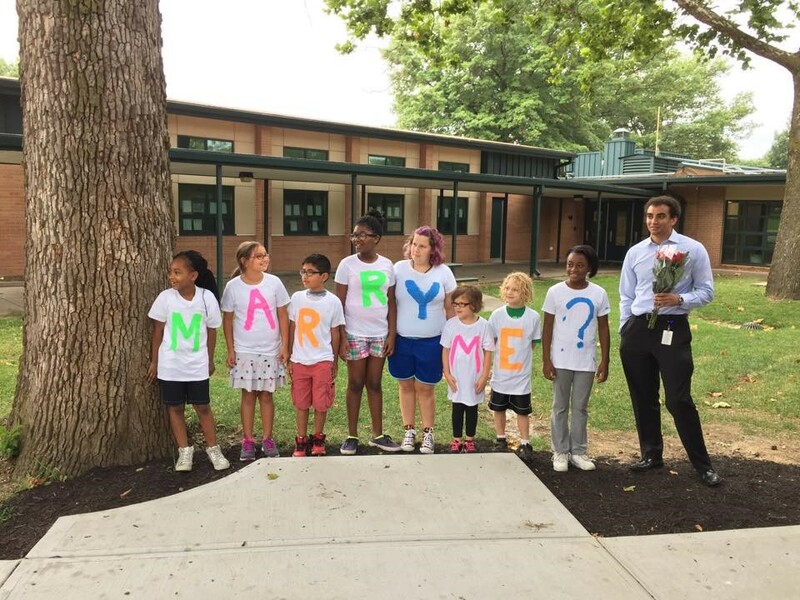 One morning, after returning to the classroom following a fire drill, Lauren turned a corner to see several students wearing shirts that spelled out "Marry Me?" and Jonathan standing with a dozen roses and a timeless white gold halo engagement ring. "Couples get engaged every day of the year, but there certainly is something extra special about proposing on National Proposal Day and the first day of spring," Shane said. "Spring is about new beginnings, and I can't think of a better day for couples who want to start life together, or who want to recommit to forever, to surprise their significant others with an engagement ring or diamond band as a symbol of their love." Shane Co. is the largest family-owned jeweler in the United States and is renowned for their unique engagement rings, wedding bands and stunning gifts for every occasion. The Denver, Colo.-based company is a direct importer of diamonds, rubies, sapphires, pearls and other gemstones and operates 20 stores in 13 states, as well as an online store at www.ShaneCo.com. Shane Co. is recognized in the industry as a price leader offering the finest array of customer benefits, including a Free Lifetime Warranty and a 60-Day Money-Back Guarantee. National Proposal Day idea: Include adorable kids in the marriage proposal. National Proposal Day idea: Get artistic when you pop the question.